Yagyu Retsudo is a man on fire. For years he's been planning the destruction of Ogami Itto, the Lone Wolf. Ogami is a one-man army, having cut down all of Yagyu's sons - except one, who's been sent to avenge his brothers or die trying! Meanwhile, the toughest cop in Edo, now retired, has the chance to take in the killer of a lifetime, Ogami himself. But is he up to the task? 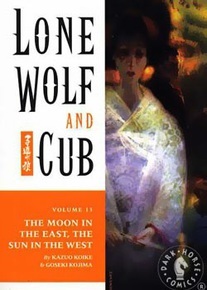 And Daigoro, the Wolf's cub, finds himself in adventures of his own, befriending a rich family and their spoiled son, and mysterious female falconers!